In what we may think of as summer, autumn has already started for many waders, and July and August are great months to look for these birds. We will be offering specialised guided Wader Tours again during August 2019. If you are interested in learning more about wader identification or would be keen to see a variety of different wader species, this is the time of year to visit. These dates are provisional and may be subject to change. Other dates may also be available, subject to tides and demand, so please contact us if you wish to discuss alternative possibilities. Even from the middle of June, the first birds start to return south, mostly non-breeders or failed breeders. Numbers really start to increase through the second half of July and August, particularly as the first juveniles start to appear. Species we see regularly include sandpipers such as Wood Sandpiper and Green Sandpiper particularly in late July and early August, plus Curlew Sandpipers and Little Stints, the latter especially later in the month as juveniles stop off on their way south. Spotted Redshanks pass through in some numbers, with some of the adults still in their striking black breeding plumage. Other mainly migrant species such as Whimbrels and Greenshank can also be found at this time of year. Regular wintering species, like Knot, Sanderling and Bar-tailed Godwits are returning in large numbers at this time to moult, and our breeding birds are still present, including species such as Little Ringed Plovers and lots of Avocet. With all this variety, we can find as many as 24 species of wader in a day at this time. Rarities are also a real possibility throughout this period. On previous Bird ID Company tours, participants have seen Great Knot, Black-winged Stilt, Pectoral, Buff-breasted and White-rumped Sandpipers, American Golden Plover and Lesser Yellowlegs. This is one of the most amazing wildlife spectacles it is possible to see in the UK. 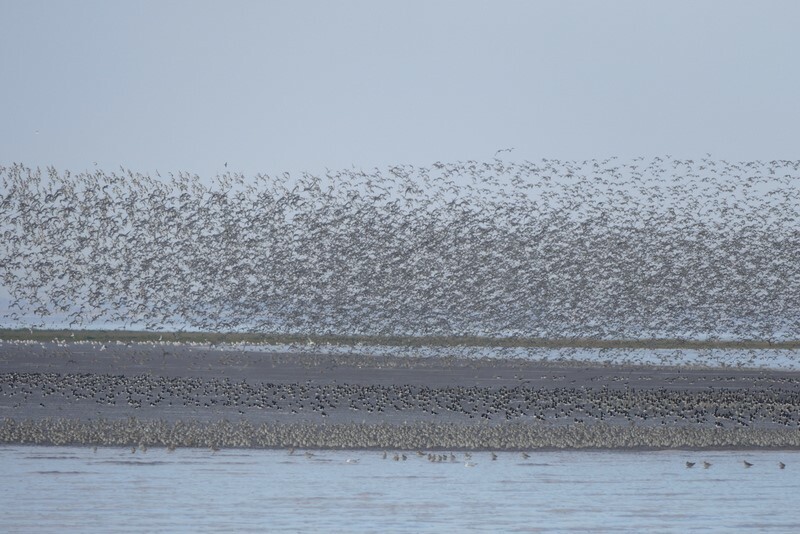 Huge numbers of wading birds congregate around the mudflats of the Wash, in north-west Norfolk. They gather at the end of the breeding season, to moult or to spend the winter. Well in excess of 50,000 birds can be present here at times, the largest number being Knot, plus the likes of Bar-tailed Godwit, Oystercatcher and Dunlin. There is usually a very good variety of other waders present too. Only on the highest tides each month, the mud is entirely covered with water. At this point, all the birds are pushed off the Wash and fly inland, gathering on the old gravel pits at Snettisham or on the fields beyond. It is a truly amazing site to see them whirling in huge flocks over the Wash and then flying overhead to roost. Wader Tours can operate as individual bird watching day tours or longer birding breaks, such as Wader Weekends across a Saturday and a Sunday or 3 day tours including a day of general birding on a Friday. Weekday dates may also be available by arrangement. Please contact us for more details. The Wader Spectacular tours will operate as a standard Day Tour, although compared to our other tours, this will typically require a very early start in the morning and we will finish correspondingly early in the afternoon, to allow everyone to recover. These dates can also be combined with other tours, as part of longer bird watching breaks across a weekend or more. Again, please check the itinerary to see how these dates fit with our other tours, or call us to explore the various options.